A NURSE stationed at Inyathi District Hospital in Bubi has been arrested for smashing the windows of a car belonging to his wife’s lover. Chelesani Tshuma (30) had caught his wife Ms Sibonile Moyo (26) red handed while doing shopping with Mr Whatmore Makahamadze on Christmas Day last year. In a fit of rage, Tshuma proceeded to Monde BH 10 to check if his wife had arrived at her mother’s place. He destroyed some bricks at a house that was under construction. On the following morning Tshuma went to Mr Makahamadze’s place of residence in Mkhosana suburb and used a brick to smash the front and rear windscreen as well as a passenger side window of the man’s Ford Ranger vehicle. Tshuma pleaded guilty to two counts of malicious damage to property when he appeared before Victoria Falls magistrate, Ms Rangarirai Gakanje. The magistrate slapped him with nine months in jail for the two counts. Three months of the sentence were suspended on condition of good behaviour while a further three months were commuted to 105 hours of community service at Tshabalala Police Station in Bulawayo. The remaining three months were suspended on condition that Tshuma restitutes Mr Makahamadze of 7278 Mkhosana $120 which is balance of the cost of damage of the vehicle, and $265 for the damaged house. In mitigation, Tshuma said he acted out of anger after his wife cheated on him. “I was angry and failed to control myself after I caught my wife with the complainant. They were carrying groceries going to her mother’s place yet I am the official son-in-law,” he said. The couple has a child together and Ms Moyo was staying at her mother’s homestead in Monde while Tshuma was working in Inyathi. Prosecuting Mr Onias Nyathi said: “On December 25 at 4PM and at Mkhosana Turn Off, the accused saw his wife with Whatmore Makahamadze who was driving a Ford Ranger. The court heard an angry Tshuma went to Mr Makahamadze’s place on the following morning at 6.45AM and smashed the vehicle’s front and rear windscreen as well as a passenger door window using a concrete brick. 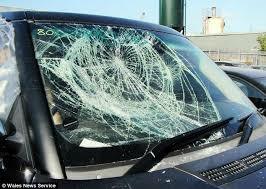 At his in-laws homestead, Tshuma destroyed property worth $265 while the value of damaged vehicle windows was $370.